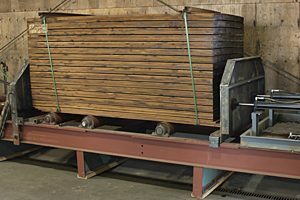 Every piece of wood on our lumber preparation line that is 2 inches and greater in nominal thickness is sorted for appearance and repackaged before treatment. Approximately 5% of material purchased as premium or J-Grade is pulled in this sort. A few items, such as 1×6 fencing stock and 5/4×6 decking, are presorted to our rigorous standards and arrive at TFI stickered and ready for treatment. These lifts enter the plant on conveyors and are directed separately to the treating lines for immediate processing. 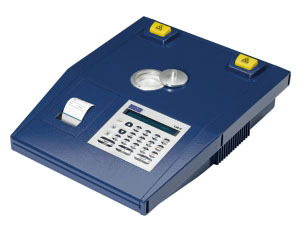 TFI uses the latest equipment to provide on-site X-ray analysis of treating solutions and treated wood samples. 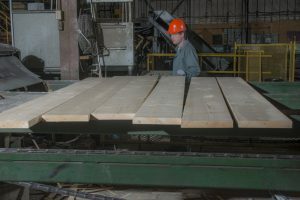 This information is vital, not only to help maintain quality control for all our activities in general, but also to provide verification of treating results for conformance to requirements of Timber Specialties’ product specifications for warranty coverage. All TFI treated wood is packaged with polyethylene wrap and plastic strapping for optimal outdoor storage. Bundles that have shifted during pressure treatment are straightened for maximum stability before wrapping. Dunnage is added to the wrapped lifts to aid in moving inventory in dealer yards.